6 and Jesse the father of King David. David was the father of Solomon, whose mother had been Uriah’s wife, 7 Solomon the father of Rehoboam, Rehoboam the father of Abijah, Abijah the father of Asa, 8 Asa the father of Jehoshaphat, Jehoshaphat the father of Jehoram, Jehoram the father of Uzziah, 9 Uzziah the father of Jotham, Jotham the father of Ahaz, Ahaz the father of Hezekiah, 10 Hezekiah the father of Manasseh, Manasseh the father of Amon, Amon the father of Josiah, 11 and Josiah the father of Jeconiah and his brothers at the time of the exile to Babylon. Corinth in the past used have some sports competition that was called Isthmian. The competition was the early stage of the Olympiad now. And back then, the sports that the people like was athletics, which was involving estafette. The people would be at the starting line, each was holding a torch. At the far end there was another person waiting to receive the torch so that he could continue to run. Often we avoid reading the genealogy part in the Bible. We often consider those kind of things to be boring, and do not have clear meaning to it. But actually the Lord does not put all of those things there just for the sake of it. Those names represent the people that stood at their era. They had persevere and defended their faith in a race. Then, they run with their own torch and pass it on to the next generation. They were the ones that made sure so that the flame will keep on burning from age to age until our generation. Right now, we are the runner. We have received the torch of faith from our parents. We are the one who is responsible to run the race with the torch of faith, and pass it on to the next generation. We need to makes sure so that the generation after us will continue to pass the torch to the next one. Keep on teaching them and make sure the fire to keep on burning for the next generation. Are you currently running with your torch of faith? Make sure it is that way because the challenge in our generation is getting heavier. 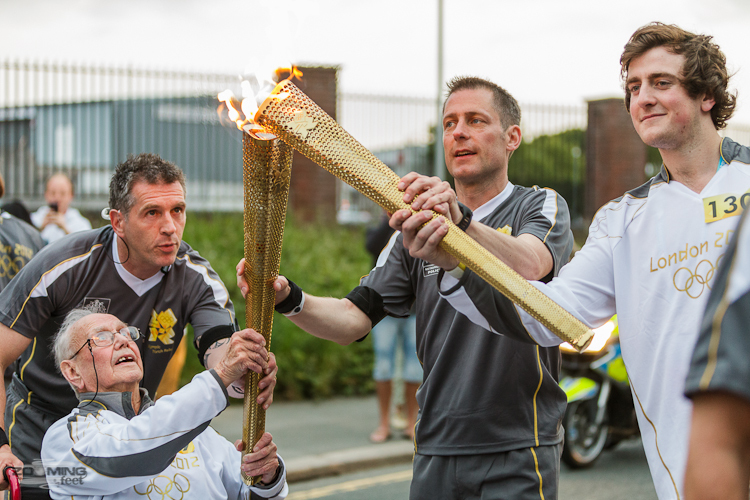 What role can you take to continue passing on the torch of faith until the finish line? Truth is a valuable legacy that will not be defeated by time and is worthy to be passed on from generation to generation. Make sure that the truth stay well-guarded in your life. This too is meaningless—a miserable business! 9 Two are better than one, because they have a good return for their labor: 10 If either of them falls down, one can help the other up. But pity anyone who falls and has no one to help them up. 11 Also, if two lie down together, they will keep warm. But how can one keep warm alone? 12 Though one may be overpowered, two can defend themselves. A cord of three strands is not quickly broken. A wild goose [Olor Columbianus] has a uniqueness that can teach us something valuable. When the winter is over, they will migrate in a pack from the southern part of America to the part of Canada and North Alaska to lay their eggs. A pact of wild geese can consist of around 500 of them. The journey of these geese has two special things. Firstly, they can fly up to 1,800 meter above the ground. That height is more than most mountains so that they can avoid any storm. Secondly, they fly in a V formation and are able to reach the speed of 160 km/hour. According to calculation, 25 of those geese that fly together in that formation will reach their destination 70% faster than when they travel alone. Why is that so? A goose will fly in front of the others and it will ‘make way’ for all of the other geese behind it. Every goose will follow the leader with their wings. This way will lessen the power that they need. The leading geese will then take turn to continue to lead in front of the others. With that strategy, they can save a lot of energy and able to travel a very great distance. Even, if there is a sick goose, the pack will not leave the goose behind. There will be another goose that will stay with the sick one until the goose is healed and can continue the long, exhausting journey. This principal should also apply in Christian family. Christian family is also called to live as a team and to fly in a pack. Our lives are full of movements. Changes after changes come by. Challenges after challenges happen continuously. Pressures of this life are so heavy to be faced alone. In that kind of condition we need to support and strengthen one another, not kicking each other out. Husbands love your wives; wives should submit to the husbands. Parents love and educate the children of the Lord; the children should obey and respect the parents. That is the first thing that we can do to be a harmonious family. Does your family work as a team? How big do you care about your family? Does your family strong in the Lord? Working together as a team in the family will be a lot more fun if we are willing to be humble and prioritize each other more. 7 Then I said, ‘Here I am—it is written about me in the scroll — I have come to do your will, my God.’” 8 First he said, “Sacrifices and offerings, burnt offerings and sin offerings you did not desire, nor were you pleased with them”—though they were offered in accordance with the law. 9 Then he said, “Here I am, I have come to do your will.” He sets aside the first to establish the second. 10 And by that will, we have been made holy through the sacrifice of the body of Jesus Christ once for all. 15 The Holy Spirit also testifies to us about this. First he says: 16 “This is the covenant I will make with them after that time, says the Lord. I will put my laws in their hearts, and I will write them on their minds.” 17 Then he adds: “Their sins and lawless acts I will remember no more.” 18 And where these have been forgiven, sacrifice for sin is no longer necessary. During the Old Testament time, the Temple of God is a structure that was separated to only do worships to the Lord. One of the unique thing here was that in the inside there were no furniture called chairs. The priests that serve in the temple of the Lord had no chance to sit. They were always active in serving and presenting the sacrifices to the Lord. They did those things in shifts. They really need to do those things over and over again for the sacrifices that they offered was not that effective in wiping the sin of the people. But, it is so very different with the Great Priest that is being told in the New Testatement! The writer of the book of Hebrews stated a startling fact, especially for the Jews with that kind of concepts in the temple of God. The fact is that we can no longer find priests that serve while standing now. On the contrary, we can get the Great Priest of the New Testatement sitting forevermore! Sitting always describes a resting condition, and stopping from a work because the work is finished. Unlike the priests in the Old Testatement, Jesus Christ had finished all His works. 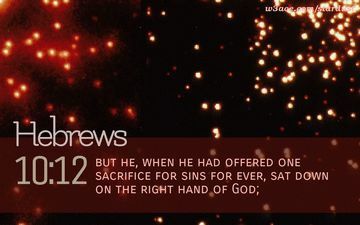 He had offered His sacrifice once, the perfect sacrifice to wipe away sin forever, which was Himself. He had gain victory that decides over people’s sin and now He sits with the Father witnessing the result of His victory. If you have received Jesus as your Great Priest, this can be a firm reason to rejoice. There is no other reason for us not to rejoice. We have been redeemed. There will be nothing we can do to add or lessen the perfection of His sacrifice. We can only, now, give thanks and also be involved in celebrating the victory. What is the meaning of priesthood of Christ for you? What is the influence of the perfection of the work of Christ for you spiritual life? Rejoice because Christ has won! The foundation of this joy will not be shaken by anything else. 7 Jesus withdrew with his disciples to the lake, and a large crowd from Galilee followed. 8When they heard about all he was doing, many people came to him from Judea, Jerusalem, Idumea, and the regions across the Jordan and around Tyre and Sidon. 9Because of the crowd he told his disciples to have a small boat ready for him, to keep the people from crowding him. 10 For he had healed many, so that those with diseases were pushing forward to touch him.11 Whenever the impure spirits saw him, they fell down before him and cried out, “You are the Son of God.” 12 But he gave them strict orders not to tell others about him. Faith is a journey. Faith will not be big and strong at first. To have it someone is going to need courage, and bravery to do the first small step. Often, this small step is the most difficult one that many fail here because they are not moving at all. 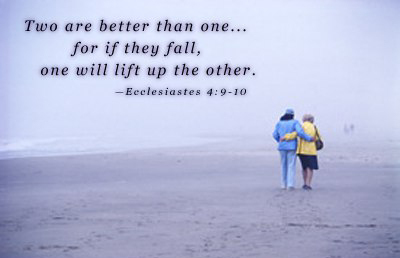 Mark 3:1-6 says about the healing of someone whose other hand paralyzed. In that story, the person was changed radically. But then, when did the change happen in the first place? The answer to that is from a small step when Jesus said to that man, “Give me your hand!” And then he gave it, then his hand was healed [verse 5]. There are many who wants to believe Jesus and wants to know everything first. Following Jesus does not mean that way. We cannot wait until we know and understand all things, then we follow Jesus! That is the whole point of faith. Who, among us, really know about the ways of electricity? Maybe, most of us do not know it. But, of course we do not want to just sit in the dark, because we do not know anything about electricity yet. There are only two things that we need to know: we need light, and electricity can give us that light. That is what making us to use electricity. We also do not really know about how our digestive system really works. We do not really understand how food can be absorbed into the blood, bones, and other tissues. But, is there anyone of us that can stand being hungry just because we do not really know how the food is digested? The first step is always the small and simple one. But do not think that it will be easy. Jesus asked the person whose other hand was paralyzed to give his hand. Maybe it is easy for you! But how was it for him? He need to give and stretch his paralyzed hand. He need to believe that Jesus can make the impossible things to be possible! Faith does not start with knowledge, but with boldness. We need to be brave to take the small step to believe. How your faith do grows? 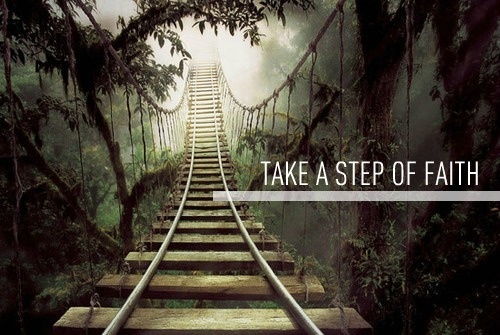 Do you remember with the small step of faith that you have ever done? How was the result? If we are motivated with our needs, it is easy for us to do what the Lord wants us to do. Be in a harmony with His interest, and do the will of the Lord. Whenever Jesus went, there are many people who went with Him and trying to be near Him. 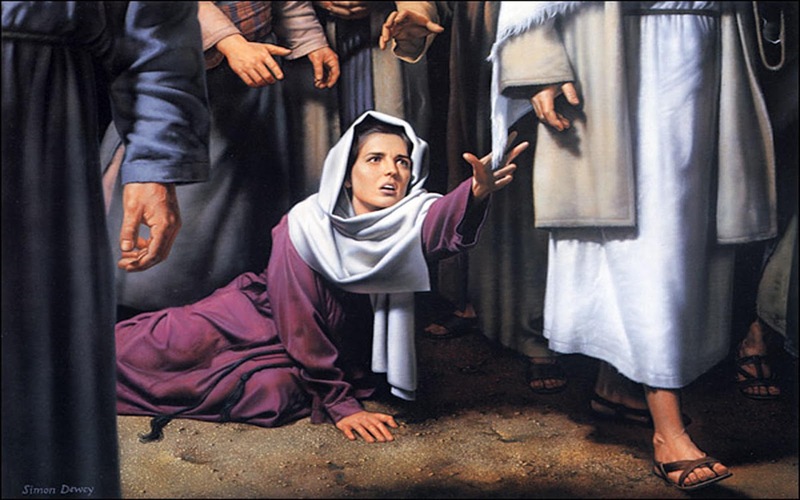 In the middle of the crowd, a lady come near to Jesus from behind and touched His cloak [v.27]. Jesus then asked, “Who touched my cloak?” [v.30]. the disciples answered, “You see the people crowding against you,” his disciples answered, “and yet you can ask, “Who touched me?” [v.31]. Jesus was the individual who attracted the most people in the world back then. In all of His time, the people gathered around Him all the time. The philosophers tried to explain His teachings. The artists made sculptures or paintings about Him. Psychologists explain the greatness of Him. There were so many people gathered together around Him. But among those many people, there were no one that touched Him. Jesus was only considered as an inspiration giver, not Saviour. Every week for centuries, people gathered around Jesus from the whole world, including us. All of us can come from around the world with various desires and motivations. The sick hope for healing. The poor hope for riches. The problematics hope for deliverance. The question is how many do touch Him and builds relationship with Him? Our lives will be so different if only we want to build relationship with Him. Do not worship Him without touching Him! Invite Him to come fully into our lives. Prepare Him a place in your home. Involve Him in every movement in our lives. He understands us better than ourselves. So be an individual that can be more like Him through the right understanding about Him. Do our spiritual lives are like the people who gathered together around Jesus? What can you do so that you can touch Jesus? Intimacy cannot happen instantly. Build an intensive relationship with Lord Jesus. 13 You, my brothers and sisters, were called to be free. But do not use your freedom to indulge the flesh; rather, serve one another humbly in love. 14 For the entire law is fulfilled in keeping this one command: “Love your neighbour as yourself.” 15 If you bite and devour each other, watch out or you will be destroyed by each other. 16 So I say, walk by the Spirit, and you will not gratify the desires of the flesh. 17For the flesh desires what is contrary to the Spirit, and the Spirit what is contrary to the flesh. They are in conflict with each other, so that you are not to do whatever you want. 18 But if you are led by the Spirit, you are not under the law. We need to surrender our lives fully to the Lord. It means that we have to die first! Right, we have to die first! We need to kill our flesh with all of its lusts and desires. That is the consequence of being Christ’s. Our own ego must no longer exist if we really want to be His. Always remember that the EGO with all of its greatness will never be the master of itself. Why? Because the EGO is mortal and limited and it is limited in its mortal state, and this EGO is destructive in nature. This EGO is the one that needs to die! Sin is beginning when men do not want to be servants; when men want to be master over everything. Men want to be like God. That is what the devil offered to men until men fell. With their ego, men want to be free. But what happened? Indeed, men often think that they have the ability to play ‘God’, but honestly men have been separated from the true source of life. Men have been dead. Men are condemned. 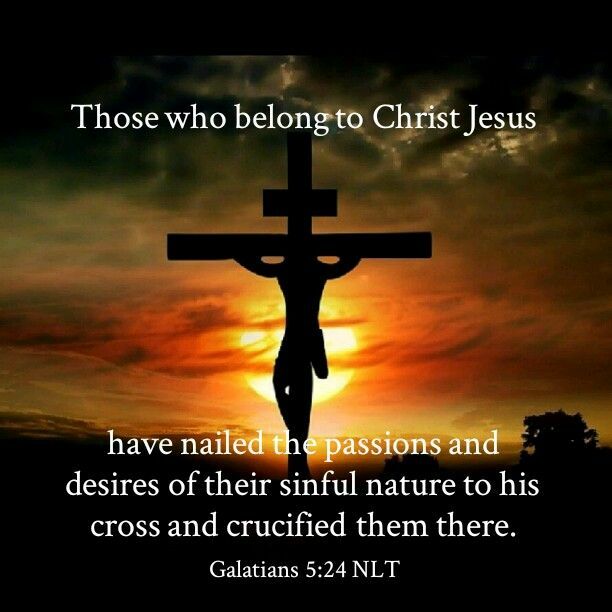 Jesus Christ had replaced men to die on the cross. His death and resurrection raise us up from the dead. We can have a complete life in Jesus Christ. But this EGO that controlled us all this time must die! The process to kill our EGO lasts for the rest of our lives. We have the potential to be sent back to the early designs of the Lord and that process will just begin after the EGO has been crucified. Does your ego still lives? How dominant is it? For you who are struggling with your ego, how hard is it to kill the ego? Is there anything that can slow it down or make it faster? Surrender ourselves fully to Him who created us. 1 Out of the depths I cry to you, Lord; 2 Lord, hear my voice. Let your ears be attentive to my cry for mercy. 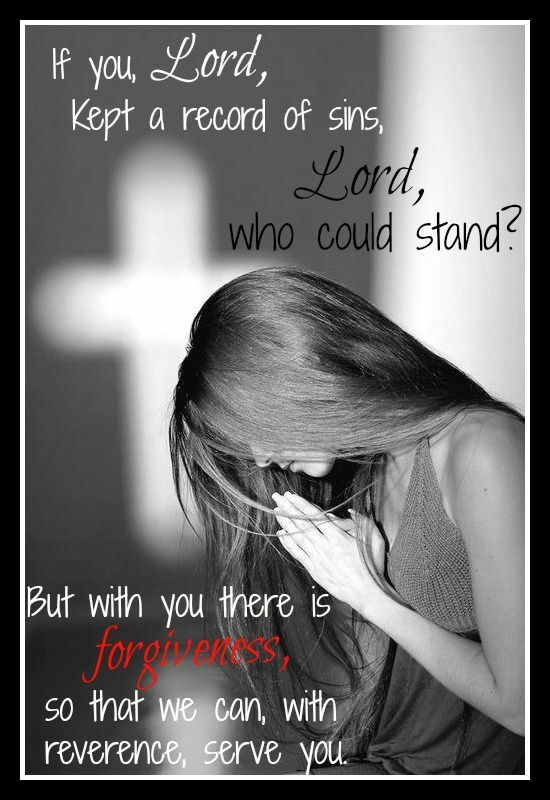 3 If you, Lord, kept a record of sins, Lord, who could stand? 4 But with you there is forgiveness, so that we can, with reverence, serve you. 5 I wait for the Lord, my whole being waits, and in his word I put my hope. 6 I wait for the Lord more than watchmen wait for the morning, more than watchmen wait for the morning. 7 Israel, put your hope in the Lord, for with the Lord is unfailing love and with him is full redemption. 8 He himself will redeem Israel from all their sins. To forgive mistakes is hard enough, let alone to forget the works that other people had made towards us; it is not an easy thing to do; much less if we are in the guilty side. When we have regret and admit and ask for forgiveness with all our hearts, and the other side have already forgiven us, how would you feel when that mistake is being brought to the surface again and again? It is said that we have been forgiven, but whatever things we have done in the past could not possibly just gone from our minds. There are also those who probably say that someone can be forgiving, and forget about the past, but that someone no longer want anything to do with us. He/she choose not to build relationship with us anymore because of the trauma and do not want the problem to repeat again. From the two response of forgiveness that we can experience or done, just imagine how our God would have done it. What if God says, “I have forgiven you, but I will not forget.” or what if God says, “I will forgive you, but from now on let us not contact each other. I will never speak to you again and you do not need to contact Me again!” How would it feel? We will be the unluckiest person in the whole world! And who can stand separation from God? Heartache is like an infected wound. That wound cannot be pressured or be kept. That wound cannot be hide and closed by band aid. The dirty blood in it must be pumped out. It means that we need to forgive and forget. Do that not just for the people who have made mistake, but also for you as well. Keep on revealing the love to every one because that way you will receive forgiveness from God. From the three responses above which is the one that you usually do? How is that? How can you forgive and then forget? It is hard indeed to forgive and forget. But then, that is what we should do in the process of moulding so that we can be more like Jesus.